We, the team on Blue Tide, cannot believe that our time with the crew is almost up. It has been an amazing session, and every member is sad to see it come to a close. During this session, Will was our first Skipper of the day and his positivity and passion for sailing started our adventure off wonderfully. Will, Chandler, Gabe, and Martin were our four advanced sailors, and all four of them earned their advanced sailing and VHF certifications in addition to impressing us with their sailing ability. 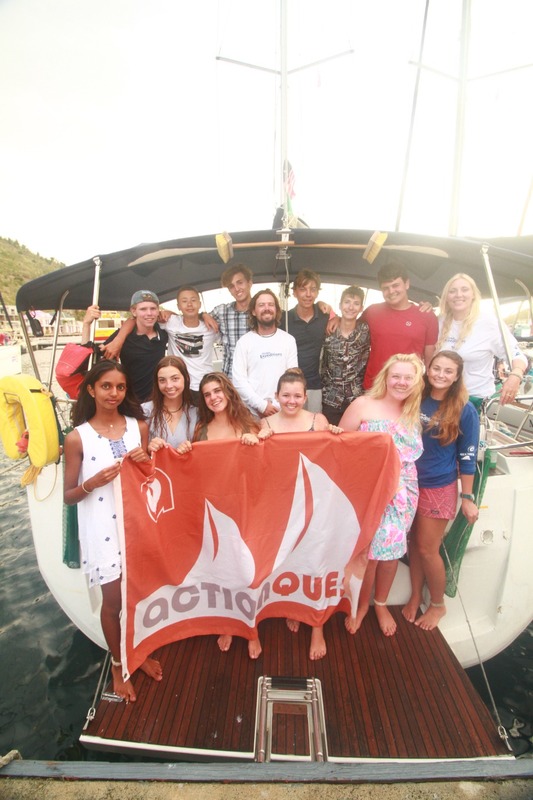 We then began having Rotation Days, which are action filled days where we all rotate through different activities, such as scuba diving, sail training, dinghy sailing, wakeboarding, windsurfing, knot tying and more. Taleena, Julian, and Eli all got up on the water skis and wakeboard for the first time! Daphnee was a completely natural windsurfer right from the start! In between rotation days, we sailed from Caribbean island to island, and during these sails the crew learned how to operate each part of the boat, eventually becoming independent sailors in time for the first race on day 17. Jonathan was skipper for the race day and Will, Gabe, Chandler, Eli, and Lucia were skilled helmspeople who brought the boat to speeds up to 8 knots and secured 1st and 2nd place in both race 1 and 2, respectively. Another arena in which the crew demonstrated their skill was the sandcastle competition, where the shipmates expertly created and sculpted a dump, a shoe, and a mouse— alluding to both tragic and hysterical saga of throwing away everyone’s shoes (which we got back!!) The crew worked so well together and produced such a masterpiece that Blue Tide won second place! Anytime we had a small respite in between activities or after dinner, there was never a dull moment. Alex, who always had a smile on his face, revealed his goofiness more and more as the session went on. Sydney also kept the moral high with her funny comments and positive and open attitude. What a grand adventure it’s been, these 21 expeditionary days out here on the waves of the sea. Thank you, everyone on Blue Tide, for becoming so close. Thank you for your unexpected hugs and hours of laughter. Thank you for your growth and self-discovery. Thank you for being open and kind and ready to smile. Your smiles will be remembered here, at ActionQuest, long after you’ve returned to life on land. You’re a part of a grand tradition of sailors and pirates, seamen and woman, and travelers of the world’s oceans, who feel, deep in our hearts, the call of the waters and the wild. Thank you, dear friends, for a beautiful, exciting, and exorbitantly fun Blue Tide Session 2.